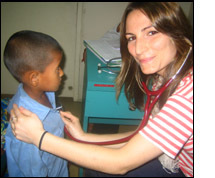 I spent the month of March providing medical care to patients in rural Bangladesh. After landing in Dhaka, the capital, it was a ten hour bus ride to the coastal district of Chilmari and then a short boat trip to the floating hospital that would serve as my home base for the next four weeks. The hospital is situated on the Brahmaputra River and provides much needed medical care to what is known as the Char Region. This is a conglomerate of remote and isolated islands that appear and disappear at the whim of the river over the course of months to years. People on these islands live without electricity, without modern conveniences, and, until recently, without any real access to medical care. The Emirates Friendship Hospital travels amongst the Chars and is staffed with paramedics and physicians who deliver much needed care to the people of these islands. There are surgical camps scheduled throughout the year and, when there are not camps present, the hospital functions as a clinic/urgent care center with beds for short stays. Each morning boats arrive carrying patients from many of the surrounding islands, both near and far. Hundreds of patients are treated each day with problems ranging from the common cold to malaria. My time spent on the floating hospital in Bangladesh was eye-opening. The poverty and need are almost impossible to imagine coming from New York City where there is literally a doctor on every corner. I quickly learned how readily I was able to make little impacts every day whether by providing simple reassurance or very necessary antibiotics. I also quickly learned my limitations. On one of my first days seeing patients I diagnosed a 4 year old girl with kidney disease only to realize her father could not afford to pay for the three hour trip it would take to get to the nearest hospital for treatment. My time in Bangladesh would prove immensely rewarding but, at times, just as equally frustrating. On this trip I learned a tremendous amount about poverty, about world healthcare, about the people and country of Bangladesh, and also about myself. It was, at times, trying, but at the end of each day incredibly gratifying. And, what I will carry with me the longest are the images of all the smiling faces of children who were so happy just to sit next me or hold my hand.